On the second day of the Street Food Fest the amazing cuisines are mesmerizing the Delhities with its taste and aroma at Rajpath (New Delhi). Bringing together some of India’s culinary street food chefs with their unique style of street food fusion to Delhi, the Ministry of Housing and Urban Affairs, GOI have invited National Association of Street Vendors of India (NASVI). 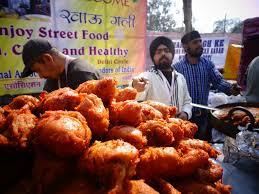 40 Street Food stalls are put up to celebrate the Fest (Shehri Samridhi Utsav) and also to create a huge culinary platter where people can try out all kinds of different dishes. The prime objective of the event is to generate prominent platform and exposure for Street Food Vendors from all over the country. With all the different vendors there is an ample opportunity for everybody to try cuisines from all over the India. NASVI believes that many countries protect and promote street food as street food enterprise contributes immensely to local economy and tourism. The concept of traditional street food has acquired new dimensions in developed countries, with food streets/ food centers emerging as new tourist attractions. Evidences also suggest that the street food prepared with safe handling of ingredients have more nutritious values in comparison to the foods served in hotels and restaurants. More than 100 street food vendors on Thursday joined the mass training program on food safety and hygiene and vowed to build their capacities towards ensuring sustainability of food security, health and nutrition. Mrs. Sangeeta Singh, Head of Street Food Program (NASVI) said it is an occasion to reassert that the grassroots street food entrepreneurs play a wonderful role in poverty reduction, employment generation and enterprise building, and they make cities charming for all.